What would represent a good season for Spurs? 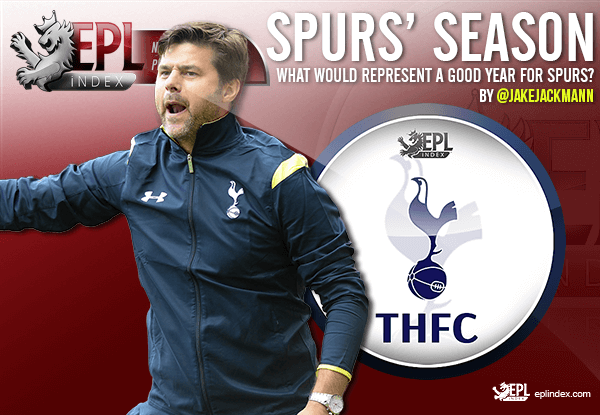 EPL Index > EPL Index Featured Article > What Would Represent a Good Season for Spurs? Tottenham Hotspur have made great strides under Mauricio Pochettino since the Argentine swapped the South Coast for North London. Last season, they finished third after being involved in the title race for a large part of the season. Although they finished below Arsenal again, there is optimism that Tottenham are on their way to surpassing their local rivals in the coming years. They have a young squad and will have Champions League football this season, for the first time since the 2010/11 campaign. They managed to qualify for the quarter-finals on the previous occasion and will be hoping for a similar run this year. They have managed to keep hold of all their star players and have made a couple of new signings to add further depth to the squad. Tottenham were already prepared for the Champions League and haven’t had to do much further business this summer as a result. Pochettino has put together a young squad, with cover in almost every position and as a group, they should continue to improve year-on-year. This approach is refreshing, but relying on a young core of players can have its problems. Tottenham crumbled in the last few matches in April and May and showed how vulnerable they can be under pressure. Although they will want to finish in the top four again, the competitiveness of the Premier League will make it difficult for Spurs to qualify for the Champions League this season. There will be seven or eight teams that could make a run at the top four, and as such three or four will have to miss out. Liverpool and Chelsea will both have lighter schedules as they don’t have to compete in Europe this season. This can be a huge advantage in the Premier League and both will be confident of getting back into the top four. Also the arrival of three world-class managers will make this division even more competitive over the next 12 months. Antonio Conte, Pep Guardiola and Jose Mourinho are all winners. As such, they will be targeting the Premier League title and won’t be content with just finishing in the top four. This will make the title race fierce and have a knockdown effect to the rest of the league. Spurs struggled under pressure last season and that is an area they must improve upon, or face a slide down the table. Pochettino needs to manage expectations among the fanbase and has done a good job of doing that so far. He will know that several of his players had their best season for Spurs last season. Some will continue to improve, while it is possible for some to go the opposite way. Also he will have the issue of the Champions League, which he needs to pay full respect to. In the past, he has played different elevens in the Premier League and the Europa League. However he can’t do that with the Champions League. He will have to play strong teams in both with only minor rotation. A good season for Spurs at the moment is a top six finish and a good run in the Champions League. It would consolidate them as a side to be reckoned with and another season of relative success for this group of young players. The project at White Hart Lane is a long term one and it will be in two or three years time when they will want top four finishes every season. Last season perhaps accelerated these aspirations, but Pochettino will realise that this squad is still some way from being considered a regular Champions League force. The additions of Victor Wanyama and Vincent Janssen fill a need, but aren’t the players to push them further. Spurs fans need to be patient with both Pochettino and the squad this season. If they aren’t, then they could end all the good work being done at the club. Spurs struggled under pressure last season – and now have that experience to draw upon. The type of pressure they were under towards the end of the season was, frankly, disgusting! Being forced to play virtually e game on the Monday evening meant they got locked in a cycle of catch-up. It also meant they never got to put the pressure on Leicester by playing before them and winning. Managers and players, before playing either of the protagonists, were publicly saying they wanted Leicester to win. The Swansea manager said he wanted Leicester to win ‘for his friend, Ranieri’, sent out a team against them without a striker and then gave them the softest goal star in the history of soft goal starts! Pulis said he wanted Leicester to win, sent out a team who barely tried against Arsenal a few days before playing Spurs and a team who barely tried against West Ham a few days after playing Spurs – but lo and behold sent out a team against Spurs who played like they were in a cup final! And then the Chelsea lot started gobbing off. And the FA did nothing, NOTHING! At the start of the ill-fated Battle of the Bridge (as it has been called) the Chelsea players were diving into challenges like they were prepared to injury themselves and their opponents to make it clear how much they were determined to prevent Spurs from winning. Fabregas kicked out at Dembele and was apparently giving Lamela all kinds of vile abuse, Costa tried to elbow Vertonghen in the throat and then leaned in with his head. This is a club who have gotten away with bullying Spurs (and plenty of other teams) and inflicting all kinds of dark arts on them for years. And what did Clattenberg do? NOTHING! Yeah, the Spurs lads unraveled a bit eventually in that match and then dropped out of the zone. But did United ever face pressure like that? How many title challengers have? And they the youngest team in the BPL. Fergie would have tolerated any of that, and perhaps that is one of the things he advised Pochettino on when they had lunch shortly before the end of the season. Calling it ‘presents’ hardly does it justice. It is unlikely that they would face that type of pressure again – competing with a real underdog who ‘everyone’ wanted to win the title. And this young team and manager will be much better equipped to cope with any pressure now thanks to that year’s experience. P,S, bloody corrective text!!! ? Take it one step at a time. We finished top 3, so top 3 plus a trophy is progress. ?? Yes teams were falling on their swords like some Kamikazi who failed to lop off his head for king and god. The FA heaped the pressure on with the Monday matches. It also served to take Spurs out of the news (except after defeat or draw. A draw against two ‘top 4’ sides became ‘failures’.) I do not think however that we should say a 5th or 6th place finish is an improvement. Yes, top 3, the FA Cup (I love the FA Cup final – a trip to Wembley with all but the gooners watching. It would be a great gift for the fans, a thank you for their support. Even in this skill forsaken place. A good run in the Champs League, semis, is a must also. Poch has surprised me, I didn’t think he had it in him. I’m sorry, and thank you. I’m fed up of seeing the Leics guy on the tele and hoardings. Did he win the Golden boot. No! Was it ‘Arry, Yes. OK c’mon you Spurs. Categories: EPL Index Featured Article, EPL Team Analysis, Tottenham Hotspur, and Tottenham Hotspur (NN).' 'Tags: Arsenal, Champions League, Chelsea, Mauricio Pochettino, Pochettino, premier league, Spurs, THFC, Tottenham, Tottenham Hotspur, Victor Wanyama, Vincent Janssen, and Wanyama.